This inventive Jazz treatment of some of Ernesto Lecuona's compositions features a few of the winners of Cuba's JóJazz competition, an annual competition dedicated to young Jazz artists in Cuba. Four different pianists - José Luís Pacheco, Alejandro Meroño, Rolando Luna and Alejandro Falcón - take three songs apiece. There is a stellar roster of musicians in the combos for which each of them did arrangements as well. Each of the four pianists brings a different musical personality to their selections, which range from very relaxed (but virtuosic) to very intense. There is a nice mix of moods in the compositions as well. 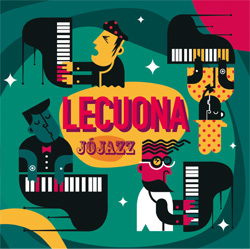 Lecuona JóJazz was nominated for a Cubadisco award in the Jazz Cubano category in 2015. I'm not sure whether it is out in the marketplace yet, but it will be worth having when it is. 7. Canción del amor triste. Recording, Mix and Mastering Adalbeerto herandez "Berti"